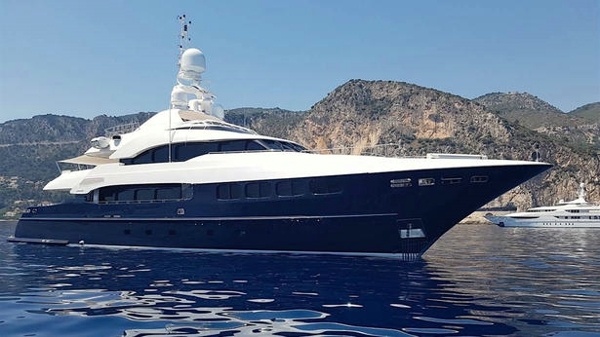 The 40 metre Mondomarine motor yacht My Way, listed for sale by Mysea in Monaco, has undergone a €600,000 price reduction. Designed by Cor D Rover, she was built in aluminium by Italian yard Mondomarine to RINA class and delivered in 2005 with a thorough refit in 2016 including a new interior. An elegant interior by Luca Dini in blonde mahogany with madrona burl wood accommodates up to ten guests in five cabins consisting of a master suite on the main deck, a VIP suite and three twin cabins, all with entertainment centres and en-suite bathroom facilities. In addition, there are quarters for eight crew in this yacht for sale. The open plan main deck saloon has comfortable furniture, a bar and an entertainment centre including a large television screen, while forward is a dining area with seating for up to 12 guests around an inlaid wooden table. The aft deck is shaded and has plenty of seating and a table for cocktails and entertainment. Up on the sundeck, a solarium extends over the entire area and offers a Jacuzzi, bar, barbecue grill, seating and sun loungers, making this an ideal spot for relaxation and al fresco dining. The skylounge is another great area for relaxation, with ample seating, a bar and an entertainment centre. As would be expected from a Mondomarine yacht, the propulsion package is excellent and comprises two 2,255hp Caterpillar diesel engines giving a cruising speed of 17 knots and a range of 3,000 nautical miles at 12 knots with comfort assured by zero-speed stabilisers. My Way is now asking €6,900,000.